Sugar doughnuts are deep-fried in oil, making them rich in calories. Nearly half of the calories come from fat, and most of the rest come from refined carbohydrates. Because sugars, white flour and other refined carbs have fewer nutrients than less-processed ones like whole-wheat bread, strive to minimize them in your diet. In addition, the publication "Dietary Guidelines for Americans, 2010" recommends limiting fat to 20 percent to 35 percent of total calories and getting 10 percent to 35 percent of calories from protein. Balance your doughnut with a lean, high-protein food such as scrambled egg whites. On average, a medium sugar doughnut about 3 inches in diameter contains 192 calories. 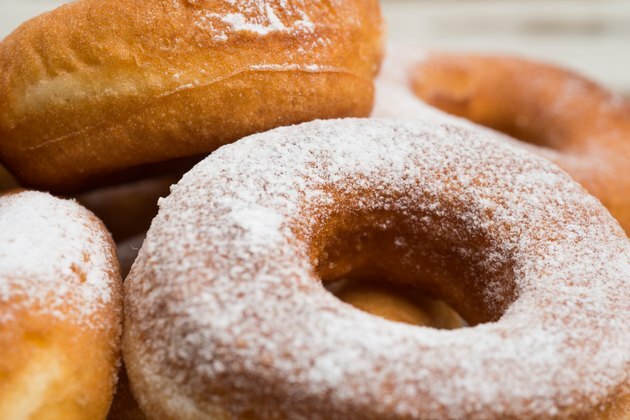 Despite the high calorie count, doughnuts contain few nutrients, so eat them sparingly. If you can't resist the doughnut temptation, eat just half, or opt for a miniature doughnut instead -- each mini version contains just 55 calories.